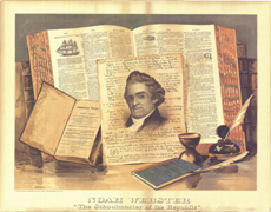 He went to Yale and was the only one of the Webster’s five children to go past grammar school. Noah and Nathan Hale were at Yale at the same time: Hale was three years ahead of Noah. He socialized with Ben Franklin, who was known as quite a lively character. Noah loved music and dancing. He once lived in a house in New Haven that belonged to Benedict Arnold. Noah and Rebecca had six daughters and two sons. He was invited to the White House for dinner but was uncomplimentary of this event. The dictionary took Noah 27 years to compile and was published when he was 70 years old. Noah’s, An American Dictionary, published in 1828, contained 70,000 words. As an adult, Noah was frequently in debt. Noah became more conservative in politics and religion as he aged. Though known as an abolitionist, he did not believe that blacks were equal to whites. Noah received less than one cent per copy from the 25 million “Blue-Backed Spellers” sold in his lifetime. Possibly as many as 100 million copies of the “Blue-Backed Speller” were sold by the 19th century. Noah was very outspoken and frequently pointed out the flaws of others. Noah was not elected to the Constitutional Convention because of his open criticism of Connecticut leaders’ financing of the Revolutionary War. Noah’s remained committed to education throughout his life. He believed that the survival of the United States depended on its educated people. Noah died in 1843 at the age of 86. He is buried in New Haven’s Grove Street Cemetery.